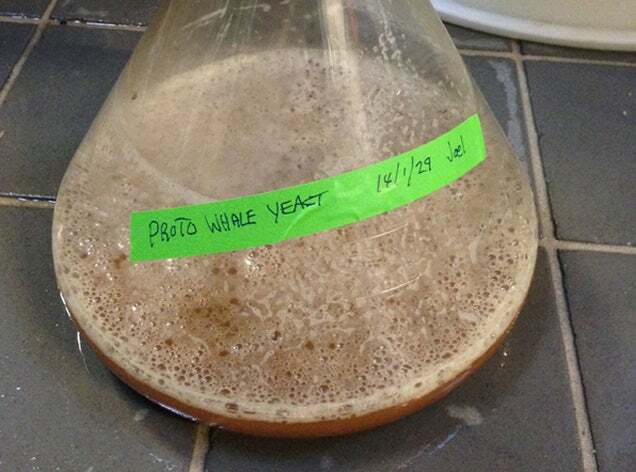 As microbrewers continue their quest to brew beer with ever stranger ingredients, here is one possible winner: yeast living on the 35 million year-old fossil of an extinct whale. Bone Dusters Paleo Brew is the alcoholic brainchild of a brewer and a palaeontology lover. It was man by the name of Jason Osborne, who chairs the nonprofit Paleo Quest, who first dreamed up the idea to interest people in palaeontology with the aid of beer. He got Jasper Akerboom of Lost Rhino Brewing Company on board to brainstorm possibilities for the drink. Akerboom initially suggested a Jurassic Park-style beer made from yeast preserved in amber, but that proved a bit ambitious. Instead, they headed down in to the fossil archives of the Calvert Marine Museum in Maryland to swab old bones (top photo). They eventually found one yeast that could ferment beer. This yeast turned out to be a variant of Saccharomyces cerevisiae, the workhorse yeast of breweries everywhere. In honour of the protocetid whale fossil that it lived on, they plan to name the variant Saccharomyces cerevisiae var protocetus.